Over the last two decades, discoveries made in the field of cognitive neuroscience have begun to permeate humanities and social sciences. 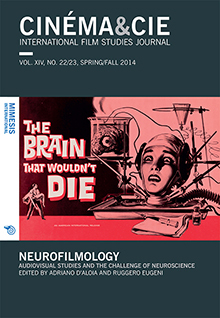 This special issue of Cinéma & Cie focuses on major conceptual and epistemological arguments arising from the dialogue between audiovisual studies and neurosciences. In the context of this intersection, Neurofilmology is an interdisciplinary research program that arises at the encounter between two models of viewer: the viewer-as-mind (deriving from a cognitive/ analytical approach) and the viewer-as-body (typical of the phenomenological/continental approach). Accordingly, Neurofilmology focuses on the viewer-as-organism, by investigating with both empirical and speculative epistemological tools the subject of audiovisual experience, postulated as embodied, embedded, enacted, extended, emerging, affective, and relational.